The Apple ID acts as the pivot point around which Apple’s ecosystem turns. It’s an account that you use to manage iCloud, purchases, subscriptions, and lost devices, among a dozen other purposes. This account covers everything in the Apple ecosystem, but it’s also difficult to work with, as Apple made it quite inflexible. You can’t merge accounts or split elements out of them. You can’t transfer purchases, nor can you make purchases with a single account in multiple countries, if you live and travel in multiple places regularly. 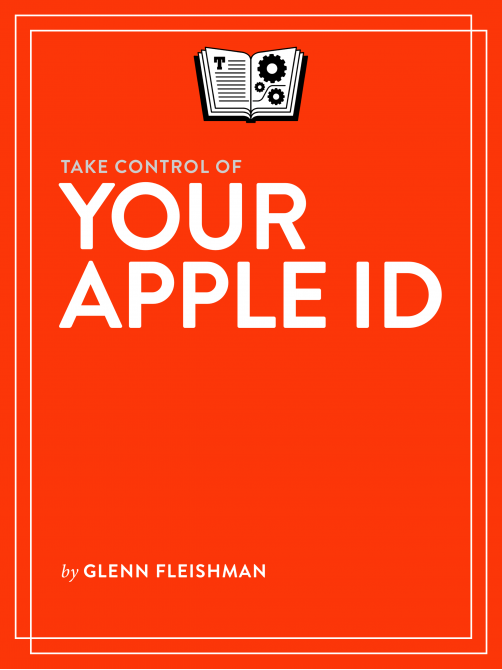 My new book, Take Control of Your Apple ID, distills everything I’ve learned over many years, including from thousands of emails I’ve received at Macworld in writing the Mac 911 Q&A column. I know the problems people have experienced, and how to solve them—or whether they can be solved at all. This book is both a source of advice and troubleshooting, but also has two other purposes: I tell you how to better prevent account problems, such as difficulty recovering account access if something goes wrong. And I describe how to recognize a hack in progress against your account—and how to stop it while it’s underway. It’s a slim volume at 76 pages, and costs just $7.99. Snag the ebook today! Folks, last year I printed by letterpress a 64-page book that contained six reported articles on typography, printing, and language I’d written in the previous couple of years. This was part of my design residency at the School of Visual Concepts. Every page in the book was painstakingly printed by hand. You can watch a time-lapse video of me printing. To fund the costs of this project, I ran a Kickstarter campaign that offered a numbered edition of 100 copies to backers. It was a great reciprocity: the project I wanted to create would produce books that funded the project! That edition was bound by Jules Faye, and I’ve just finished sending out the edition of 100 to those backers. I have a limited number of additional copies of this book that are essentially identical, and will be marked as author’s proofs in the colophon instead of being given a number. I’m happy to sign and inscribe them as you like. Find out more about buying a copy via this link. Some photos below. In this book, you’ll learn about the history of intentionally blank pages, Google’s effort to create a font that includes all the scripts of all the world’s languages, when people starting SHOUTING IN CAPITAL LETTERS, whether the Internet will kill off curly quotes, the difference between slanted and italic type, and how a Web site planned to archive itself for 10,000 years microscopically. You can also read more about the process of making the book. An ebook edition with four additional articles is also available, including how letterpress came back from the dead. You can also purchase a single chapter of the book in letterpress form: chapter 2, “CAPITAL CRIMES,” about the use of shouting with uppercase. This chapter is bound with a mylar cover and comes with a small note that explains how it was made. I wrote and produced three books in the last year, and I thought it might be a good idea to highlight that they’re all immediately available as ebooks, and two of them in print editions. My latest, London Kerning, I’ve written oodles about: it’s a journey into England’s typographic and printing past told through current collections in hard-to-visit archives in London, and through contemporary type designers and letterpress printers there. The second printing just arrived from the printer, and you can purchase either an ebook or a print copy—or both! Last year, I produced a letterpress edition of Not To Put Too Fine a Point on It, a collection of my reporting stories on intersections of printing, type, and language. While that edition of 100 sold out, I will have some author’s proofs available later in spring. But you can purchase an expanded ebook edition, with 10 reported stories, including an account of making the letterpress book, right now! For those concerned about or interested in keeping their iPhone or iPad safe, last October I published the latest extensive update to Networking, Privacy, and Security in iOS 11, which offers exactly what is on the label. Detailed, illustrated, step-by-step instructions as well as insight into how to secure your device, keep your data private, and connect to networks and peripherals. Get the ebook immediately. You can also purchase a print-on-demand copy. My work schedule and intensity often prevents me from focusing enough these days to read books, something I find frustrating, and am working to revise. The flip side is that I read thousands of pages of books online this summer and fall in researching articles, and that was absolutely delightful. I have completed three books recently, and I'm recommending them all. 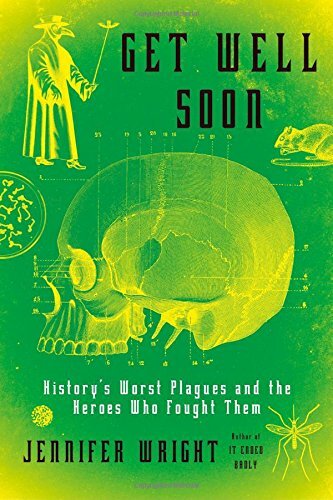 The first is Get Well Soon: History's Worst Plagues and the Heroes Who Fought Them (2017, end notes, bibliography) by Jennifer Wright. Jen is delightfully funny on Twitter and also a force to be reckoned with in fighting against misogyny and cruelty. Her book on plagues seemed like a funny match to her public personality, but I enjoyed it from beginning to end. I'll say that she tries to ease us in. The book is written in a sometimes aggressively peppy and informal tone, and the book starts out heavily in that style, and then drops down into a more level pace once we understand that the title will be enjoyable and not a recitation of death and blood. Massively annotated with citations (using end notes, to make the main text readable) and full of bits of history I never knew the full and true story about, Get Well Soon extols a lot of great people, some of whom were forgotten or maligned. She finds mostly heroes and some villains. The chapter on leprosy is particularly moving; on lobotomies, a human plague, a definition I fully agree with after reading it; and on the dancing plague surprising and bizarre. If you wonder how humanity has survived, pick this up. I particularly recommend the subsection in "Bubonic Plague" titled "The Exploding Frog Cure." Earlier this year, after discussing with a friend typewriting races—speed competitions for keying in words—I recalled there were words used among typesetters to test speed, too. That led me to the book The Swifts: Printers in the Age of Typesetting Races by Walker Rumble (2003, glossary, end notes, bibliography, index). What the heck?! This monograph helps you understand the life and nature of compositors or typesetters in the 19th century, and led to a number of articles and explorations I made this summer. Typesetting was a tough job and hadn't changed much since Gutenberg. While everything else in printing sped up, including the manufacture of type, composition largely remained the same, relying on the frailty of humans working as fast as they could. As the century advanced, speed races among typesetters became a fad, and many were held. The fastest compositors were called swifts (and according to one contemporary source I found, fire eaters). But even as these races became popular, the hot-metal Linotype typesetting system became practical and shifted the majority of composition from one-at-a-time hand work to keyboards. This was an okay change, though: the book notes that in 1850, the average age of death of a printer (including typesetters and pressmen) was 28 years. Horrifying. As the Linotype era started, despite the pots of boiling lead involved, working conditions did, too. The average death age increased year by year until it was about 53 in 1920, the same as other male adults. It's not all bleak! The swifts had fun, and drank like fish, and had their own typographers' bars, and traveled as journeymen, and led the life of Riley. The book also covers how boys started apprenticing around age 13, the attempt by women to enter the field, and the remarkable anti-union behavior of Susan B. Anthony. The book bogs down into racing statistics at times, but it's generally a rollicking and super-informative slice of life. You understand how typesetters lived and the era that ended. This summer, I went to a talk by David B. Williams, a local author and naturalist who had a co-written book coming out in the fall called Waterway: The Story of Seattle's Locks and Ship Canal (2017, bibliography, index). As a 20-plus-year denizen of Seattle who loves the waterway that winds through the city, and with scattered historical knowledge about how it was fitting together and things cut through—we live near a passage called the Montlake Cut—I enjoyed the heck out of his talk and got the book the moment it was out. It's lavishly illustrated and beautifully written. He and co-author Jennifer Ott, an environmental historical, trace the massive hydrologic and soil changes carried out by a couple generations of city leaders, local businesspeople, and the Army Corps of Engineers. It's a narrative with relatively little intrigue and corruption, but rather fights among competing visions of restructuring Seattle combined with challenging nature. A river's course is reversed. Another is blocked and effectively removed. A large portion of Elliott Bay is filled—with soil from a canal excavation that was never completed. The one that was lowered Lake Washington by nine feet. And the book doesn't just look at it from the view of immigrants from the east, but native Americans relationships with the water, and how the reworking affected where they lived, what they ate, and their ability to continue their intertwined lives with salmon. I think of it as a quintessential Seattle thing to know all the bodies of water and canals between Elliot Bay and Lake Washington, and I see them all with different eyes after reading this book.